The key to successful teaching is demonstrating, not explaining. So what is the key to successful teaching or training? It’s the golden rule of effective facilitation, what really helps you get something across to your learners. You can explain it till you’re blue in the face but when you demonstrate it? BAM. Next time you’re struggling to get your clients to ‘get’ something? Show them. Give them a real life example. Draw pictures. Find someone doing it, and doing it well so they can link the theory, to a tangible, real life experience. That way? You’re leading them on a learning journey. Throwing a bucketload of information at people and hoping they’ll be able to regurgitate or use it later, is about as effective as those uni lectures where everyone fell asleep or passed notes to one another to pass time time. Taking people on a learning journey is what creates real change; it’s what helps them not only learn the lesson, but actually make the changes in their lives so that they’re making their worlds into better places. And instead of explaining it anymore? You guessed it, I’m going to demonstrate. I’ve got two examples for you. One is an article where I literally demonstrate the art of structuring a lesson – I explain it first, then give you a demo, then give you a task to go and try it for yourself. Ready to see what I mean by demonstrating? Unless you’re already familiar with my infamous ZUZU example, have a look here. It’s a free lesson. Get on it! The second, is a testimonial. This is one of my clients, Cat LeBlanc, talking about how demonstration is so much more powerful than explanation – and how she learnt that teaching and learning nugget (no prizes for guessing who taught her)! Ready to learn how to confidently use this and other ninja delivery techniques to ensure your clients are interacting with you, and perched on the edge of their seats wanting more? Great! 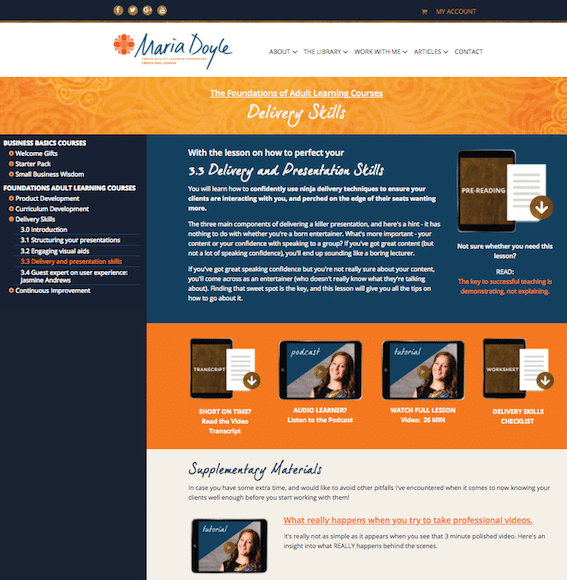 I’ve got a live online workshop coming up, or some self study online resources you can access immediately below. Prefer some self study online materials? I’ve prepared a tutorial and a checklist on the signature techniques I’ve learnt from 20 years of being in classrooms and keeping my adult students, clients and audiences engaged. Demonstrating is just one of them. Ready for some more insider tips and tricks? ← How to choose the right delivery platform for your training content.